I just want to say Thank you for your Kindness.it a great store excellent in helping me have a wonderful day.bless you. My God.. went to your shop in dagengam Heathway. As soon as I put my foot in the dour the assistant shouts out WWITH ARE CLOSED. WE CLOSE AT 3PM. Fair enough but because of her rudeness I looked at the time. It was only 2.55.. so went in and said it's not 3 o'clock yet.she replied hurry up.. I knew what sandles I wanted.. so asked if she had them in a size 5. Abruptly she says THEY ARE ALL THEIR. Found I Size five. So again asked could I have these. She replied you look for it . If she was in such a rush to get closed up . She should have helped me.. I would have been sorted quicker.. As it was I still got served by 14.59. So she had I minute to close the shutters.. The store is always very clean and tidy. It smells fresh and not stinky like other shoe stores. When u walk in what your looking for is right in front of you and they are all at a reasonable price. The shoe sizes were all correctly labeled and if you bought a shoe that was size 6 when u put it on it was a size 6. 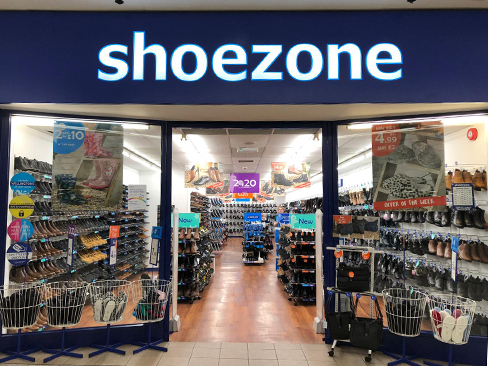 So i would recommend shoe zone for when you would like to get some nice looking shoes. The staff are all lovely and when you ask for something they won't point to were it is they would show you and I think that is really nice of them. Staff behaviour is worst. They do not have minimum courtesy to clear any doubts. I believe this would definitely effect your reputation. Sorry to say but I would never like to purchase in shoe zone again.